If you love musical theatre, you owe it to yourself to see at least one show on Broadway in your lifetime. No matter how good the shows are that you have seen, nothing compares to how tight of a performance you will see in New York City. This is the place that actors, dancers and musicians aspire to perform, and when roles are filled only the best are selected. Also, after a show had played for a few months, there are no silly mistakes and the sound is completely dialed in. It makes for a complete audio and visual experience. 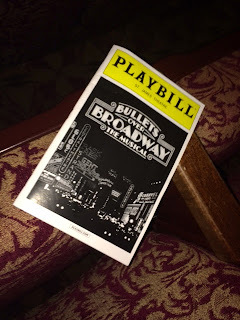 Whenever I travel to the Tri-State area, I always make a point to get into the city to see a show, and last month I got to check out Woody Allen’s Bullets over Broadway, the Musical at the St. James Theatre on 44th Street next to Sardi’s. This 1700-seat house opened in 1927, and it is an interesting place to see a show. The seats are tiny, and legroom is tight, and if you are in the balcony there are oodles of steps to walk up, and no elevator in sight. Luckily our show was not sold out, so we could spread out a little in the balcony. It is a cool theatre, though, with great acoustics and pretty good lines of sight, not to mention $18 cocktails. Bullets over Broadway is based on Woody Allan’s 1994 film of the same name. The film had an all-star cast and was well-received, with seven Academy Award nominations (and Dianne Wiest winning for Best Supporting Actress), and positive critical reviews. I don’t think it did so hot at the box office, but that was not enough to keep Allan from seeing how well Mel Brooks did with The Producers, and taking a shot at making it a Broadway musical. The show opened at the St. James in April of this year, and the plot follows fairly closely to that of the movie. The show is set in the late 1920s in New York City, and it is the story of a playwriter (David) who gets his show financed by agreeing to hire a gangster’s girlfriend (Olive) to be one of the leads, even though she cannot act. The show is terrible, but the woman’s bodyguard (Cheech) makes suggestions to improve the play and ends up rewriting the whole thing. This story has everything: dancing girls, adultery, violence, betrayal, substance abuse and eating disorders. What more could you ask for? Woody wrote the movie and adapted it for the stage musical, and the production is directed and choreographed by Susan Stroman and produced by Julian Schlossberg and Letty Aronson. They took the easy route on the score, and used popular songs from the 1920s and 1930s. Musical Supervisor Glen Kelly adapted these songs and added some lyrics here and there. Meh. 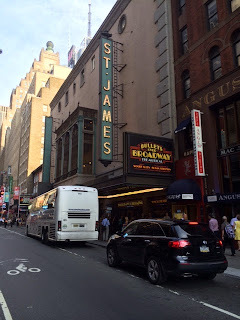 Almost everything is there for Bullets over Broadway, the Musical to be a hit. The Santo Loquasto sets are first rate, with a great rotation of elements that come up through the floor. William Ivey Lon’s costumes are gorgeous, and the lighting and sound are spot on. The audience can see and hear everything perfectly, unless they cannot see around the person in front of them, of course. They even had a dog and a Model A Ford that cruised around the stage! There is a huge cast working on this show, including a 19-piece orchestra under the direction of Andy Einhorn, a 16 member ensemble, a 7 member chorus line and 22 credited cast members. God know how many crewmembers are behind the scenes. They did not skimp on the cast, and they got Zach Braff to take the lead part of David Dhyne, and Vincent Pastore to play the gangster, Nick Valenti, and Nick Cordero to play Cheech. This is Braff’s Broadway debut and he did very well, with good acting skills and passable dancing and singing. Pastore’s acting was wooden and singing was terrible, but he was supposed to be a gangster, so he gets a pass. But Cordero’s portrayal of Cheech stole the show – he has stage presence galore and is on his way to bigger and better things. The female roles were more secondary, which is not surprising in a Woody Allan production, but all performed their parts flawlessly. It was disappointing that they could not be bothered to write original music for a Broadway show, but that is the only criticism that I have. It is much faster-paced and more exciting than the movie, and I think the story translated well to the stage. It certainly is funny and entertaining, which is a nice outcome from an evening at the theatre!